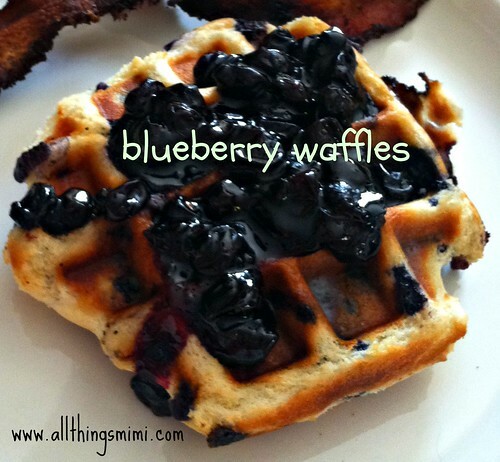 blueberry waffles, originally uploaded by All Things Mimi. So this breakfast was a total cheat. For some reason, I had a box of blueberry pancake mix in my pantry, and I really wanted to get rid of it. So I mixed the waffles up according to the package directions (except I used buttermilk) and I added some fresh blueberries. While the waffles were working, I made some blueberry syrup/compote by putting the rest of the basket of blueberries in a saucepan with some dark brown sugar and about half a cup of water. I added a dash of cinnamon and let it work away until all the waffles were done. At the last minute I mashed the compote with a potato masher, then served them together.